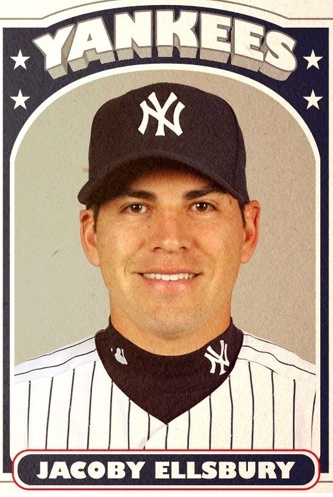 MLB released a photoshopped photo of Jacoby Ellsbury in a Yankee uniform, pronouncing he was already in his new duds. This is before an official announcement and synchronous with his physical. His steel buns survived the jet ride from his home in Arizona to the Big Apple for the big event. Ellsbury must be staying in New York for the rest of the week in order to attend a giant press conference over at the Bronx zoo on Friday the 13th. We almost figure there will be a serial killer in a goalie mask coming out of the shadows to attack him. No, Tuukka Rask would never do that, even for Boston. The Yankees love to fly in the face of convention and superstition—and holding a press conference and signing Ellsbury on Dec. 13th, Friday, is brave indeed. As every fan in Boston knows, you never tempt fate when it comes to the glass unicorn that is Jacoby Ellsbury. This week Boston fans will have a smug look on their faces, like the cat with a canary sitting on his tongue. Yet it is New York Yankees that look like the Cheshire Cat. The signing of Ellsbury is about as big as discovering Sylvester has finally caught Tweetie Pie. Little Tweetie Ellsbury has seen the puddy tatt and now his face is shaved cleaner than a hound’s tooth. His new photo makes him look surprisingly like Johnny Damon. Like all multi-year deals, this one won’t be finally settled until accounts are in arrears. Somewhere down the road we fully expect the glass fragility of Ellsbury to put him on the shelf. Whether Ellsbury turns out to be a Faberge Egg, or just another New York Humpty Dumpty, the next few years will tell us. But, Boston fans are already relaxed and breathing a sigh of relief. Tweetie Pie’s cage is out of our ken of responsibility. You can read about Jacoby Ellsbury in Boston in the new book RED SOX 2013: NAKED CAME THE LINEUP! It is now available at Amazon.com in softcover and ebook format.